As its name, it was just Japanese Crispy Chicken with my usual sweet and sour sauce. Posted my all-time-favorite Sweet and Sour Pork recipe long time ago, and it’s a dish that I always cook. If short cooking time is what you could afford only, here’s my quick fix version! Luckily, I had my standby frozen food in the freezer. One of them was this flavorful Japanese crispy chicken chunks. Just needed to bake in the oven, prepare sauce and combine them. 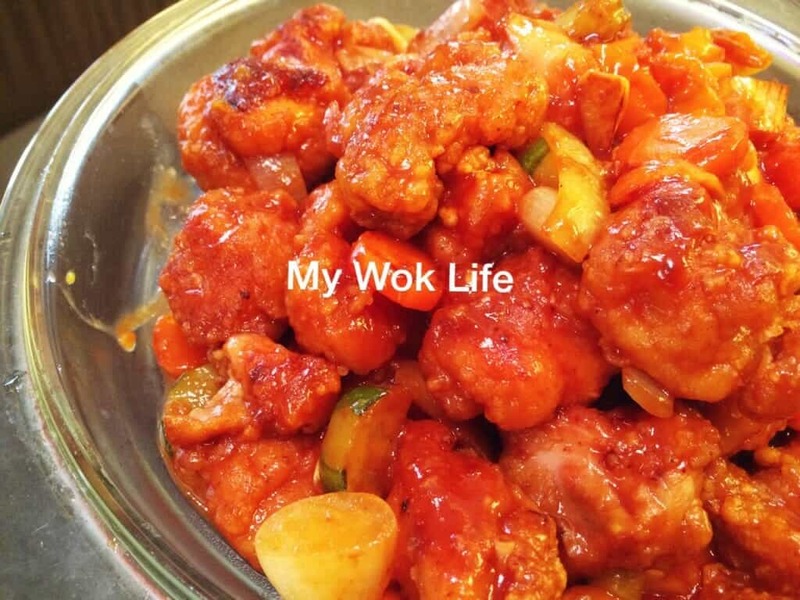 Dah-dah… How easy it was to present this delicious sweet & sour dish! (1) Place frozen chicken chunks in lined oven tray, and bake in middle rack of the oven at 180deg Celsius for 20 minutes. Set aside when done. (2) In a medium bowl, combine Ingredients (B) to make sweet & sour sauce. Stir to mix well. (3) Heat oil in wok over medium fire. Sauté onion and carrot. When half done, add garlic, tomatoes and cucumbers. Continue to sauté. If necessary, sprinkle some water to moist (instead of adding more oil) during the sautéing process. (4) When most ingredients are browned, add baked chicken chunks. Reduce fire to low heat. (5) Then, drizzle sweet & sour sauce. Stir to combine. Drizzle cornstarch slurry to thicken the sauce. Stir to combine well. Heat off and dish up. Serve with steamed rice. I used Tay’s Japanese Crispy Chicken which you could get at major supermarkets eg NTUC Fairprice. You may use other frozen crispy chicken bites, too. I tried and recommend CP brand golden crispy and New Moon brand popcorn chicken original. However, do not use frozen chicken Karaage to cook the dish as these chicken Karaage bites appeared to be too saltish for this recipe. Anyway, these frozen processed chicken is already flavored, no matter what. Hence, do not over season the sauce. Salt is to omitted in this recipe, in the case. Tips: Assemble the dish only when ready to serve. It has to be served crispy so as to avoid the sauce from drying up over time. Hi, may I know if i can make do without the worcestershire sauce for the sweet and sour sauce? Thanks! Go ahead and try without it! Alternatively, try using Balsamic vinegar dressing.